What are little girls made of? Sugar, spice and everything nice, but in different proportions than the cake below. Isn't she dear? The raspberry cake is delicious but no match for this sweet thing. From the kitchen of One Perfect Bite...It's not my habit to make berry cakes in October. This one was the result of my inattention. I had pulled what I thought was a bag of cranberries from the freezer, only to discover my labeling system had failed me and I actually had raspberries that now had to be used. While I had planned to make a flan, I decided to use this cake as a stand-in. It's very old-fashioned and one of the first cakes I learned to make. I love to add blackberries or raspberries to the batter. It's an everyday snack cake meant for family and close friends. It's a bit like a Swedish Visitor's Cake, but it's not as refined and it's much quicker and easier to make. It can be oven ready in 15 minutes. It is best frosted when slightly warm and I prefer to eat the cake the day it is made, as it stales quickly. Here's the recipe. 1) Adjust a rack to middle third of oven. Preheat to 375 degrees F. Lightly grease and flour a 9-inch square pan. Line bottom of pan with parchment or waxed paper. Grease and flour paper. Set aside. 2) Place butter and sugar in bowl of an electric stand mixer. Beat until smooth, about 2 minutes. Add egg, vanilla and milk. Beat just until combined. 3) Mix flour with baking powder and salt. Stir flour mixture into wet mixture with a large spoon, until well blended. Do not overmix. Pour batter into prepared pan. Scatter raspberries over top. Bake for 30 to 40 minutes, or until a cake tester inserted in center of cake comes out clean. Remove from oven. Cool in pan for 10 minutes. Invert cake and continue cooling on a cake rack. 4) Meanwhile, combine confectioners' sugar with butter and beat until smooth and creamy. Add salt, vanilla and milk, a tablespoon at a time, until frosting can be easily spread. 5) Transfer cake to a serving plate. Frost top with icing while cake is still slightly warm. Some icing will spill over sides. Yield: 6 to 8 servings. This post is being linked to Pink Saturday, sponsored by Beverly at How Sweet the Sound. They are both so delicious looking, but you had better eat the second one! Look at that precious face. And that cake - marvelous. Love the cake but the little girl is adorable. Happy Pink Saturday Mary. What a darling little girl with her pink hat and what a fabulous berry patch cake. I always look forward to your post for Pink Saturday. You're so creative with pink and an inspiration to us all. You always have the best recipes -- perhaps this will be on the table the next time I have company for tea. That little one is adorable! The cake recipe reminds me of one my grandmother used to make, called Thrifty Cake. It was a favorite of ours. What a precious little doll! Delightful raspberry cake! I think it's wonderful to have such a recipe in one's repertoire. Perfect for days when one does not have the time or inclination for a more involved recipe but still want something delicious. thank you so much for sharing this little gem. I'm in complete agreement...whoever the little darling is in the photo, she is precious. I so enjoy your blog and am looking forward to going through all your posts one-of-these-days to add to my arsenal of recipes. With most of my little ones having flown the nest, my desire to cook seems to have left with them. Hoping that by adding some new recipes, perhaps it will ignite the desire to spend more time in the kitchen once again. Do you freeze your own berries? If so, I'm curious as to how you preserve the raspberries. I saw the photo of the sweet girl in pink in my reader, and had to rush over. Cute!!! And the Berry Patch Cake is quite similar to the one I make, only I add lemon pudding. Mine's yummy, and I bet this berry cake is too!!! Have a terrific Saturday Mary. I'm just taking my raspberries out of the freezer as we speak after seeing your recipe. The cake looks devine. Oh Mary....I love raspberries and this sounds so good! seems a berry cake would be perfect anytime of year .... yummy ... so gorgeous looking AND that is one precious little, a perfect combo to your luscious cake! 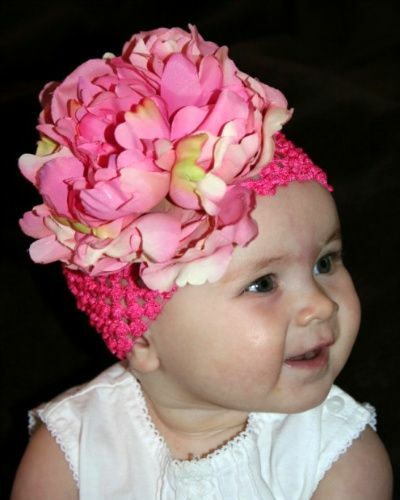 omg that is the cutest hat EVER! The cakes too scrumptious too. Berries are crazy expensive here right now, but I think a pice of that would brighten my entire day. OMG, the litle girl is soooo adorable! And the cake looks as gorgeous as her...beautiful! Mary, thank you for your many visits while I have had so little time to visit back. I have made this recipe with blueberries. Yum. The photo is adorable. I love berries in cake- so delicious! And the little girl is precious! I agree, sugar (how appropriate! ), about that sweet thing! I'd take a bite outta those cheeks in lieu of the raspberry cake in a heart beat, chickee. This cake....o, my goodness...reminds me so much of one my mother used to make...and I had forgotten about. Thanks so much for the recipe...and the memory. Have such a wonderful weekend, friend Mary. Hi Mary, that little sweetie is a perfect Pink Saturday pic. She is darling! Your cake looks amazing. Yum! Thanks for visiting us too. I checked out the loading of our story and it seemed to work quite quilkly from my end. Who knows? Have a great week. Oh my goodness...how adorable is she!! Your cake looks yummy! Sorry you got out the wrong bag! What a delightful "pink" cake. We made Fannie Farmer's recipe for old fashioned mac and cheese last night. After trying every "designer" recipe from the Food Network and more, nothing tasted more comforting than that one. We have decided it is a keeper for awhile. Wishing you a Happy Pink Saturday! They are both looking just fine. The baby is a doll. What delectable pink confections! Thank you for visiting The T-Cozy today. Have a lovely Pink Saturday. Such a gorgeous baby girl in her sweet pink cap..and what a sweet cake. It looks delicious as does everything you make. Happy Pinks and have a wonderful weekend. That baby girl looks good enough to eat! Or at least kiss those cheeks like crazy! Your cake looks delicious. Happy Pink Saturday! Looks delicious and relatively easy to make. I must try this recipe at some point. Ooooo that looks so good! Definitely a recipe to try! Beautiful and mouth watering. Thanks so much for being so generous w/your incredible recipes. No doubt about it friend, you have some of the greatest recipes. Will love trying this. Thank you so much for stopping by. You made me laugh-- those cute fairies are such a delight! Your cake -- OOOH dear, this could cause my behind some trouble. Wish I was a 1/10th the cook you are. My microwave is my best friend these days. Precious sweet angel! She's so pretty. The raspberry cake looks fantastic too and simple to make. I have so many frozen fruits in the freezer. I'm headed there now to dig through and pick one for this cake. My husband will thank you later! Oh my that cake looks yummy but I agree with you- nothing can top a sweet little girl picture! My DH and I have a Chat and Coffee time every Tuesday for part of our ministry and I make a homemade goodies each week. So glad to see your sight and all the yummy looking recipes!! Will have to try some of them including the berry cake! Thank you for lovely comments on my blog.Happy Pink Saturday! Thanks for always leaving such sweet comments over at my place! Have a wonderful pink Saturday! Mary... It looks like a "star" is born and I'm not just talking cake! Berry cake all around ~ have a great weekend. As always, had to stop by to see what we wee having to eat today. I would love that cake, as I love raspberry flavor in most anything. However, the darling little girl stole the show. Happy you visited and left a always welcomed comment. She is so cute. An always yours recipes are yummy!!! Happy Pink Saturday, Mary. She is an adorable bundle of pink. Raspberries and cake. Yum! Many years ago, my mother had a neighbor that baked every day. When I was pregnant, she brought yummies over all of the time. I don't have any idea where she is now, but I think of her every time I prepare one of her recipes. Happy Pink Saturday. Another delicious dish that I must try. I'm very interested in making the Vietnamese fish dish as well. I was so hoping that the little pink girl belonged to you...she's a cutie. Have a great week. Come visit Crock Pot Wednesday when you can. 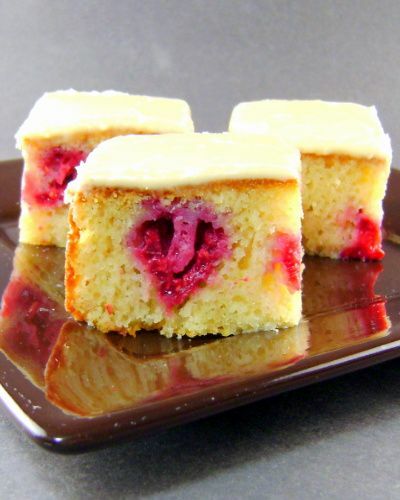 Raspberries in a cake. Happiness! Sunshine! Tasting summer again. Easy recipe - priceless! Looks simply grand! What a darling little girl! And the cake looks SO GOOD!!! I'm hungry!!! Thank you for visiting me today!! Hope the coming week blesses you with sunshine, happiness and good friends. Looks delicious, and those raspberries definitely add a wonderful splotch of color. That little girl in the pink hat is darling! Everything you make looks and sounds delish! Mary, thank you for visiting my blog and leaving your kind comments! That little girl in the flower cap is delightful! What a great way to start your Pink Saturday post! The cake looks delicious . . . another wonderful recipe to try from your kitchen! That baby is the cutest thing!!!! And the hat just topped it off! Sorry I didn't make it over on Saturday. I had company all weekend so I am having Pink Sunday. Your berry cake looks yummy. As I told you in a comment a few days ago...your crumb receipe made me a fan of yours for life! Thanks for sharing. Such a pretty pink cake! This look delicious. This is one I will definitely try. It reminds me of something my mother would have made and served to friends and famiy who always dropped by for coffee, the days when things were slower and people just dropped by your house, my childhood home was different my parents had a greenhouse business at home so people family and friends always knew they were their and dropped by, we lived out in the country, how I miss those slower times. That's what this cake reminded me of the minute I read your description, brought back fond memmories, thank you Mary. I would love a bite of that cake - particularly the bite with the berries :) Yum! that little girl is adorable! love how you can say the fruit in the cake. The cake looks yummy, and the baby is precious! This looks so yummy!!! The little girl is adorable!